Back in 2011, AT&T had attempted to buy out T-Mobile for around $39 billion from Deutsche Telekom. After the deal went south, Tmo’s place in the US market was uncertain and its value dropped considerably. As a plus-point of the buyout falling through, T-Mobile got around $7 billion in cash and spectrum as compensation and has used that to good effect. The company also merged with MetroPCS Communications. This enabled the company to expand its coverage and launch a LTE network. The lightning-quick expansion of LTE and the market-changing Uncarrier plans had returned T-Mobile back to the value it was at when AT&T tried to purchase it back in 2011. As for the big question regarding a sale of DT’s controlling share in T-Mobile US to Softbank, Hoettges refused to comment. According to Bloomberg’s own sources, DT is wanting an all-cash offer for T-Mobile, if any purchase is going to happen. We’ve also read previously that Softbank is trying to raise around $20 billion in financing from the same banks it used to fund the Sprint purchase last year. The only issue here – of course – is that $20 billion will no longer be enough to secure the 67% stake in T-Mobile US currently owned by Deutsche Telekom. Now, DT could look at this opportunity in two different ways. 1) T-Mobile US is on a high, and at its highest market value in two years. There’s never been a better time to sell. 2) T-Mobile has just launched one of its most aggressive phases of Uncarrier so far, paying of early termination fees of anyone who wants to switch. It’s clearly going to continue growing in value and popularity. Instead of being an unsuccessful string to Deutsche Telekom’s bow, it’s now the feather in its cap. Why get rid of its most promising property? Apart from struggling to get the cash together for the deal, Softbank will also have to deal with the American governing bodies who may resist any deal to merge two of the “big 4” carriers. Reducing down to 3 carriers would alter the competitive landscape of the US telecommunications industry. Softbank can’t afford for the deal to go south. It has a lot of debt following the Sprint acquisition. With T-Mobile being so valuable, it would certainly seem like there are more obstacles to any deal going through than there was a few months back. If the two companies are kept separate (Softbank) being the mother company, then I don’t see why it can’t fall through off there is enough money on the table. Keeping two national carrier separate would cost a lot of tax and manage then to put together sprint CDMA T-Mobile gsm. Timotheus Hoettges is a complete liar. The company is only worth $26 billion according to its stock price on Friday. Not $42 billion. That’s far less than the $39 billion AT&T was willing to pay AND the company did not have MetroPCS assets like it does now. It’s not good when the new CEO starts out by lying about such verifiable information. $26B is market capitalization which does not include the value of DT’s stake. Yes it does. If it didn’t include DT’s two-thirds the total company would be worth $78 billion—and nobody is saying that. Right now, their stake is approximately $17.3 billion of the total market cap of $26 billion. In addition they are owed about $11 billion by TMo-US. They stuck that debt onto the company right before the merger. They wanted to stick $15 billion on, but the Metro shareholders balked so they reduced it. So $17.3 + $11 billion is only $28.3. Far less than the $39 bil that they would have received from AT&T. Those are the facts—unlike what the DT CEO is trying to lie about. I have no idea where you got those numbers, but, here’s how it actually works (note, this is a rough calculation). Current market capitalization is roughly 23.5B rounding a bit, but close enough for this. Divide that by 33% because that is the amount of the shares on the public market and you get 712M. Now we need to multiply by 100 to get total capitalization giving a total of 72B. Now, T-Mobile has, as of the last financial reports (Q3 2013) 27B in liabilities, so we subtract that from the 72B, giving us 45B, since the last report, T-Mobile has offered 2B worth of bonds, so we need to subtract that, giving us a valuation of 43B by this rough estimate. Now, usually you wouldn’t subtract debt from the market capitalization because market capitalization is just the sum of all outstanding shares on the public market, but, if you own more than 50% of a company, you have to report their debts as your (DT’s) own. So, for the valuation of DT’s part of the stock, it does need to be subtracted from the total valuation. The debt owed to DT has a zero bet impact because DT has to report it as a liability of a subsidiary but also gets to report it as an asset. I admit, 43B isn’t accurate as I rounded, don’t have all of the latest figures and was just doing some quick calculations. Now, I’m not saying that T-Mobile’s market cap would be 72B if DT were to sell all of their shares on the public market, it wouldn’t be because the market would respond by lowering the price of the stock to account for the debt, how this would work is more in depth than I would like to go in to in this already too long post but, it would. T-Mobile stock is likely propped up a bit by the artificial scarcity created by the fact that only 33% of their stock can currently be purchased on the public market, so the true valuation is probably a little bit lower. If DT’s share of T-Mobile was included then why was Metro PCS’ market capitalization 4.384B on april 1st and 3.058B on May 1st when the merger closed? That would mean that at that time, the entire value of both DT’s ownership and outside shareholders value of T-Mobile was -1.326B at the time of the merger, which is absurd. Market cap dropped because DT took ownership of 67% of Metro PCS in exchange for 33% of T-Mobile and the market hadn’t yet responded to account for the value of 33% of T-Mobile. So, those are the facts and before you ask, my sources are a degree in business and the ability to do a search and look up the definition of market capitalization. Google search: WSJ TMUS. On the TMUS quote page it says there is a public float of 259 million shares. That’s what the public has to trade. And it says 800 million total outstanding shares. So that leaves DT with 541 million shares or 67%–their current percentage of ownership which can be verified by multiple sources. And 541 million @ today’s price of $32.51/share is $17.59 billion. So this whole $42 billion that the DT CEO is throwing out is nonsense. All 800 million shares are currently valued at $26 billion. That’s it. I’m not going to keep arguing this with you. If you feel its such a lie, you better call the SEC. Although, if it were inaccurate there would be lawsuits and fines so they might already know. I don’t know if the SEC is really concerned if a foreign CEO is lying about what a company is worth. But anyone with a calculator can do what I did and see that the stock isn’t worth anything close to $42 billion. Are you taking into account at&t was willing to pay a lot more for T-Mobile than they were worth at THAT time? I think I remember during the time analysts were shocked at the premium at&t placed. Yes, you are correct. The analysts were shocked that AT&T was willing to pay so much as they valued the company much less. Now I admit that the stock price has went up considerably since the MetroPCS merger. But it’s still not yet in the realm that AT&T was willing to pay. If T-Mobile cost More now compare 2 years ago why sell and keep it and see it through Because they already see the improvement and customers they gain from the big 3. Because if they wait and see the reverse merger will pay market value of T-Mobile so most likely DT would gain more money then the proposal 30 billion. They shouldn’t sell them short. While true that the company could be worth more later and the company is on a huge roll right now, it can also hit a point of stalling. The company can change up the market all it wants but eventually Verizon and At&t will do bigger interventions when their bottom line is hit more with customers demanding similar policies or leaving. Sprint, I hate to say it, can be a beast once their network is actually fixed. They have the potential to really shake things up with the spectrum they own. It’s a gamble if they wait and factors in the future are unseen right now. I’d like to see them hold on to it and let it continue growing or find a buyer that will allow the company to continue as it is doing. Yeah that’s also true but do u think Verizon and att would actually follow what T-Mobile did with the no contract these are money hungry company so whatever they can grab they want. So I would think tmobile is on a roll and seeing they got over 1 million new customers from the other carrier is great unlimited data around the world for free the other carrier can’t touch it. Yeah sprint network can be a beast but its gonna take time to make it work but T-Mobile network is already a beast but coverage is the only problem but now they have customers coming to them So in the next auction it could be good. But I’m hoping Softbank won’t bid and let them be and DT has to wait for the reverse merger and be out of the us and take the money and do whatever. But if Softbank do bid I crossing my fingers that the doj and the FCC do their job and stop them I’ll be happy because there’s always a break up fee. I see dish network but they say the spectrum they hold isn’t compatible with T-Mobile so I don’t know. I just don’t want to see T-Mobile gone just like the FCC and doj say T-Mobile is the important carrier in the us. I hope they stay away from Sprint(Softbank). I think T-Mobile is riding a high right now and they will continue to. They are changing the mobile industry bit by bit and making the competition quake in their boots. German company had enough with crapy government rules in US. I would sell it too. Whatever problems they have experienced with regulatory conditions, their biggest problem was vastly overpaying to buy into the market in the first place. They spent $55+ billion in cash and assumed debt acquiring Voicestream and PowerTel when the total subscriber base was just around 5.4 million. It’s been an uphill stuggle ever since. F Dish , they are a total nightmare in the making. My wife worked for them and they treat their own employees like dirt , can you imagine what they will do to T-Mobile once they buy it. You can kiss 0% EIP plans and no contracts goodbye. Your wife is completely irrelevant when it comes to what’s best for T-Mobile. Glad she found other work. But enough of this Dish-smearing. No it’s very revelant , they were rated in the top three for the most hated company to work for by their own employees in a national pole and that should say something. If your own employees are not satisfied with the management then you know it will reflect on it’s customers eventually. Look what happened to T-Mobile during the AT&T takeover , it went in the gutter. What’s best for T-Mobile DT is cash , in the end they really don’t care . I just hope Dish is no part of a buyout . I like T-Mobile just the way they are right now . Maybe I should not have used the F word but I’m not trying to smear Dish for personal enjoyment but just stating the truth from seeing Dish from the inside out from personal experience. The national poll was performed by the National Enquirer of the jobs industry. That poll was meaningless, and funded by Hollywood, that hates Dish because of AutoHop. That whole study was a hilarious farce hitpiece. I like T-Mobile the way they are now too, and that’s why I don’t want Sprint involved. :-( I truly believe Dish offers a bright future for our Uncarrier. It is widely known that Dish treats their employees like dirt. “Widely known…” classic weasel words. That’s widely known as BS. I don’t mean to seem arrogant and uncaring. I genuinely do care about your wife’s well-being while working at a company; I guess it’s just that from an internal perspective, I’ve found the complete opposite experience. I don’t even consider DISH an evil. I quite like them. But I do NOT want SoftBank involved with T-Mobile, for many reasons. 1.) No more foreigners. Let’s make T-Mobile US an actual US-based company. Dish could do that. DISH is the way to go. They are the T-Mobile of their industry. I fundamentally disagree with you. That’s an unfair broad generalization. When corporations turn a profit, it usually HELPS people, not hurts them. That’s ridiculous Occupy Wall Street talk. Classify what you want but corporations are evil. We have a fundamental disagreement here. I don’t consider T-Mobile, or most companies, inherently evil. I have a question. Why do you want Dish to buy T-Mobile so much? If anything, I think T-Mobile should not sell. Firstly, I consider Dish to be an admirable company. Dish owns a massive amount of spectrum. This can only help T-Mobile. They have a large rural presence, which T-Mobile doesn’t. They would be eager to expand T-Mo to that customer base. They have a lot of free cash on hand. T-Mobile doesn’t. Dish is an innovator. So is T-Mobile. Dish is the most affordable choice in TV. T-Mobile is the most affordable choice in wireless. Dish has the Hopper. That would make for a compelling bundle that U-verse, FiOS, and cable couldn’t even start to touch. They could beat the **** out of Comcast. Ahhh, I see. Now that you say that I wouldn’t mind dish buying T-Mobile as long as they let Legere keep running the show! And they don’t raise prices :-). Amen, brother. I wouldn’t steer you wrong. :-) That’s how I feel about the matter. Let’s see T-Mo thrive! And you have that right to say they arent. I am saying they are. It all depends on your definition of “people” and how inclusive you make it. The most screwed up industries are those in which corporations have been able to jack up their margins well in excess of the average. When that happens, the number of beneficiaries is far outweighed by the number of those who are paying for their privilege. Fire everyone on this page and replace them with the current T-Mobile officers holding these positions. Unless that happens Dish should be dissed. That will never happen. Legere would likely keep his post. And I want Ergen at the helm of a T-Dish. If Softbank was to buy tmobile would we lose Mr. Legere as a CEO? Legere has only been here to make T-Mobile sell-able. He is not your friend. While I think it is great what he has done I have no illusions about the double edged sward. No, John Legere has come to T-Mobile to revive them from their anguished properties during/after the failed AT&T merger. What Legere is doing and going to do is shake up the wireless industry, not announce that T-Mobile is being sold and just scram away. He would ruin everything if that happened. Now, if T-Mobile is bought by another company, I’m sure John will still lead the new entity and still kick the other carriers’ butts. That makes it sound like DT wouldn’t have been interested in growing the company by over 14 million subscribers in the last year through the completion of the MetroPCS merger and dynamic growth, if it weren’t for the objective of selling the company. A lot of planets had to line up for the events of the last 2-3 years to get us where we are now, but DT/TM, acting sensibly, would have made a lot of these moves whether the company was on the selling block or not. Nevertheless, you’re right that Legere isn’t your friend. He’s a chief executive whose corporate heading happens to align with consumer interests at this time. Let’s make the most of it. I hope you are right on all counts. Legere is a good man who is doing the right thing, but is also benefiting from it. What’s wrong with that? Absolutely nothing. In the meantime, he makes T-Mobile sellable like you said. These Germans just can’t wait to unload T-Mobile. It’s obvious they’d sell it to Satan for the right price. Deutsche Telekom is so shifty, they make AT&T look honest. That being said, I hope they DON’T sell to SoftBank. Three crappy carriers in the USA is enough. DISH has the spectrum, cash, workforce, and know-how to turn T-Mo up and win more customers. All talk from the outside looking in. Yes, absolutely. Why? It’s working. Why would Ergen curb growth on his investment? In their business, it is necessary to entrust a lot of equipment to the consumer’s care (eg. satellite dish itself, receivers, etc.) Contracts are the norm in that industry, and Dish is the most benevolent of any provider about letting people out of contracts. They actually let you leave their broadband service if you find a better deal elsewhere without penalty, regardless of company! We need to get past this idea that Dish is going to radically transform T-Mobile. They could keep the momentum growing. Logically, it’s more likely that TM would maintain its current course with Dish as the majority stockholder. Why? Because trading out DT for Dish still leaves the company in 4th place in terms of subscribers, over 60m behind either of the top two. A sale to Softbank would leave the latter in control of over 100m customers. The need for aggression would be considerably reduced. Benevolent , yea right . Try to break the satellite service before your two year contract is up , you will pay the $275.00 ETF fee. After one year within your contract they then pro rate your ETF . They will not just be nice and let you walk away , it’s business and they don’t want to take the loss . I doubt they will keep a no contract service then tell their satellite customers they have to sign a contract if they want the same service bundled up . I want to stay positive about it but having my wife that worked for Dish know the real inside story about how they run Dish makes me cringe every moment. For me, they just did. I had dishNET, I had some issues, they let me cancel for $0. They sent a box, I sent the equipment back. For free. I would never ever think of going to anyone else for TV, so I’m not canceling that, but satellite Internet has a long way to go. So that’s how I know they do that. I very happy for you that you got cancelled for $0 because believe me it’s not a normal practice. I’m starting to think Softbank is going to decide not to make an offer. The increased value of T-Mobile combined with the strong possibility of it getting shot down by US regulatory bodies might be more than they are willing to risk. Paying billions in breakup fees in T-Mobile/DT is something they really can’t afford to let happen. If T-Mobile does end up getting bought, it would most likely be Dish since that wouldn’t reduce the number of major carriers in the market. Well, they are sitting on a bunch of loans from the failed Sprint bid… And the DTers will say that solely to shake more cash out of deal. The sooner we are done with Deutsche, the better. Bloomberg reported over the weekend that Softbank and DT have begun direct talks. It also proposed that a collaboration with Dish as part of the terms of the merger could help a T-Mo-Sprint merger pass through the regulatory hurdles. that’s if they agree on the breakup fee. And it all hinges on how how Charlie Ergen enters the process. Is he going to barge in and drive up the cost of T-Mobile for Softbank the way he did it with Sprint and Clearwire to cause Softbank to take on a ton of debt they otherwise wouldn’t have? Or is Ergen going to play nice and collaborate? The market could go south again, and they don’t want that. I’ll be glad when they’re gone… Good riddance. T-Mobile US is the only thing that propped up DT Q3 2013 earnings, they even said as much. If they can’t afford the breakup fee, they can’t afford to buy T-Mobile. well Japanese banks are willing to give them loans for 1% interest, they are drunk on debt now so might as well keep going. This is what I was trying to tell y’all. 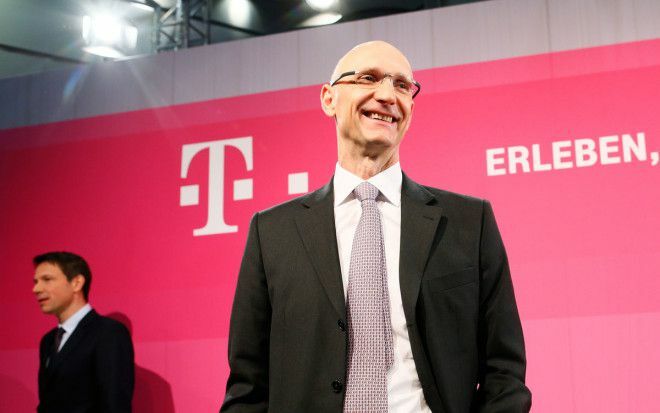 DT CEO Rene Oberman stepped down last month he was the one that wanted to sell T-mobile US more than anything. With the new growth and success of this past year who knows what this new DT CEO has in store. Obviously, he knows the US branch is the hottest carrier in America so why not try to talk it up to appraise the value higher it’s just business lol. Plus, remember this past year T-mo added LTE, Apple Products, and Metro Pcs customers and assests, and most importantly adding over 14.4 millions customers so yea T-mo’s evaluation would have increased since At&t failed to acquire them. I think DT should do this set a price but make this break up package. Sprint has more debt and less money than At&t ok so make Softbank pay less but still a fair amount. Instead of 3 billion cash make them pay 2 billion cash. Instead of 4 billion in spectrum make them pay 3 billion in 800 Nextel spectrum in most of the top 25 markets. That spectrum works real well in buildings. Next step announce the deal then all of us on here and other sites email and write our congress man and flood the DOJ and FCC websites with complaints until this fails and watch T-mo collect on the break up package and then sell to Dish or Vonage. P.S Panther Lady can you take my screename off moderation lists. They’re all the same. DT is not our friend. Period. And Vonage? :-O They’d kill T-Mobile to make way for their strange landline-mobile-calling-anywhere-smoke. lol, shoutout to the Panther Lady! It’s obvious what you want to happen lol. But you have to admit Vonage does have mobile experience also when the buyout closes from Verizon they will have $130 billion in cash and stocks. Vonage has said they plan on paying some debt and also is considering acquisitions. I could see Vonage keeping Johnny Boy as CEO and things in tact. I mean look at their current commercials like you mentioned kind of goofy lol. However, here is the wild card At&t said they might be interested in buying Vonage oh wow. Also, the At&t deal with Cricket should close in the next 2 weeks. You mean Vodaphone. Not Vonage. Very different companies. Vodafone or Orange will buy T-Mobile USA, I’m willing to bet a 6-pack of beer on this prediction. To many meeting, hurdles, and tomfoolery with the Softbank deal. I agree, from Softbanks perspective it seems there are far to many risks.. From DT’s though, it fails they likely get a golden shoot out of the deal like with ATT. I agree though, just to many likely blocks.. I’m not a fan of anyone buying out T-Mobile really. Anyone who does is likely to kick out John and kill the no-contract plans. Dish loves contracts, so does Sprint. Hopefully by the time this stuff happens, the cell service landscape will be so changed that going back to contact, high priced plans, won’t make sense. and so does SoftBank but their white plan was one of the factors with the iPhone that made them gain customers, Docomo and KDDI were bleeding customers as well when this happened but not as bad as T-Mobile a couple of years ago. ill take Orange anytime over the European version of Verizon Wireless, heck i even would love for O2 to be here! “No comment” means they have something to hide. There’s definitely a deal coming. Nope….only that a deal is still possible and is being actively talked about. But I agree with you….this ain’t gonna happen. Says the guy who “knew” the G Flex wouldn’t “make it to the States with those screen specs” (720p display). Says the guy who “knew” the Galaxy Nexus would launch on Verizon in early November, and when that didn’t happen, mid November, and when that didn’t happen, late November, and when that didn’t happen, early December when it was finally made available, all because that’s what the *rumors* were stating, Says the guy who “knew” the release date of the Evo 3D (a phone you claimed would be “Sprint’s flagship device well into 2012”, but was pulled after only 2 short months into the year) based solely upon the release date of the Evo 4G, and turned out to be a month late. Yeah, I totally believe what you say. in one of its reporters Bloomberg reported that Sohn told Sprint CEO Dan Hesse he wants T-Mobile as well. So he may have wanted both. I feel bitter towards this guy for not investing any money in Tmo all these years. Softbank is too stretched to buy T-mobile and is highly unlikely to get regulatory approval. It is like a python eating a crocodile only for its guts to spill out. I would think, private equity will buy it and then sell it strategically. They are the only group with deep pockets and ability to source global capital. I really admire what Tmobile has done. They have shaken up the industry. not happen), and the bad customer service was too much. This “value” is all smoke and mirrors right now. But I hope that changes.